After decades, Burma finally holds its first presidential election. Many Burmese living abroad believe that prosperity will soon arrive. Xing-Hong, an immigrant labourer in Taiwan, is able to save enough money to return home. His return is bitter sweet, as he is carrying the remains of a friend that died in a work related accident. When Xing-Hong arrives home, he finds that most of the young people want to work abroad, but Xing-Hong has always wanted to stay in his hometown to do business. He begins asking around for possible business opportunities. Through the protagonist's eyes, we witness the true face of Burma and the angst of its youngsters. First time director Midi Z films the milieu he knows best: like his protagonist, he is an ethnic Chinese who moved from Burma to Taiwan when at the age of sixteen to study Film Directing and graduated with his first short movie, Paloma Blanca, in 2006. In 2009, he was selected as one of the most prominent directors by Taipei Golden Horse Film Academy. Produced by Hou Hsiao-Hsien, Midi Z made a short film called Hua-Xing Incident. Return to Burma is his first feature film. While preserving an ultra-realistic documentary feel, [Return To Burma] is also inspired by classic Taiwanese new wave principles: Midi Z uses a largely still camera, with beautifully framed long takes and sequence shots that slowly reveal, with precise intensity, the essential reality of a part of rural Burma at a critical moment of its history. Early 2008, I finally went back home to Burma for the first time in ten years. Burma looked the same as I remembered when I left, a land of loess and weeds, but peaceful and quiet. I felt nothing has changed in my hometown; young people gathering together every day to play guitar and sing love songs. Every three days, they would go to smuggle motorcycles across the Chinese border, then ride 20 hours to Lashio allowing them to earn twenty U.S.dollars. In November 2010, there were elections in Burma; meanwhile the military junta released the Nobel Peace Prize winner Aung San Suu Kyi, who was under arrest house for nearly two decades. Many of the Burmese from abroad believe that Burma is changing and it's time to go back home! Early 2011, I took my camera, returned home and once again I came across those young people who sang love songs. Many were still waiting for their passports in order to go abroad to work; my childhood English teacher, Adove, also still held onto his American dream. Even though they live in the plight of sorrow, those who crossed borders passing through the wilderness and military checkpoints early in the morning or in the middle of the night still demonstrated vigorous energy of life and were full of tenacity. 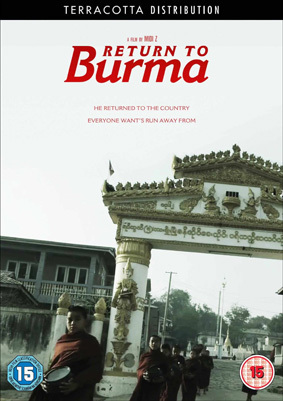 Return to Burma will be released on UK DVD on 12th November 2012 by Terracotta Distribution at the RRP of £14.99.